„James“, it sounds in the last letter I got from Rose. Rose Evans. Maybe one of the most proud pirates I ever met. And I met a lot of pirates on my journeys. “James, it’s winter. Quiet and still so that I could listen to the falling snow if I wouldn’t write these words”. While I looked at the handwriting of the young girl I asked me one more time how a child like her – rough as the sea and not one time ladylike – how a child like her could have such a wonderful, filigree handwriting. If my memories didn’t trust me, she had been a child… physical… but her sense beats the senses of lots of adults hundredfold. “James, I didn’t write to you for a few months, sorry dear… We had big troubles, but that’s the story I want to tell you today…” I saw her, while she wrote the letter. She smiled, I was sure. “It starts with me and you. It begins the day you left our ship… Oh I cried millions of tears! I’m really angry and I want you to come back – I hope you know!” While reading these words I sinked on the armchair next to me while grinding my temples. 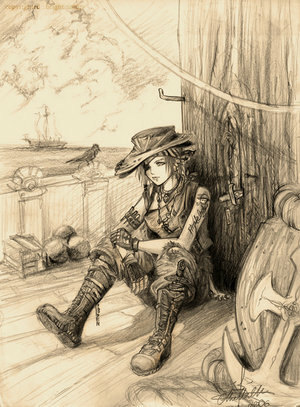 I asked me again how I could leave the sweet pirate-girl alone on her own on the oceans of the world. Of course she couldn’t die, she was deathless and she had more experience than me… She’s the captain of a crew she selected on her own. Suddenly I had a look on the picture on the table at my left side. The little girl drew herself on her own ship. She looked like a truly pirate and her deep, black but warm eyes were so perfect. “For you James, by your friend Rose”, was what she wrote in big letters on the front. “She can draw well”, I thought before I turned towards the letter again. “But that’s the story you already know. Today I want to tell you what happened after you disappeared…” I felt the pain she fought with all the time in quite a few of her words. And one more time I understood: I wasn’t one of the victims, I was the guilty one. I was the culprit. Me, a simple trader, living in the south of America… me, who didn’t understand, that I felt in love with a deathless pirate-girl… it’s me, who is the reason, why she was so near to die.